Oops: Migrants arriving in Italy and in Europe mostly from Egypt, Yemen, and other Arab countries, UNHCR rep admits. There were hardly any Syrian migrants among the 800 people rescued off Sicily, contrary to earlier reports from Italy's coastguard, the UN and the International Organization for Migration have confirmed. The coastguard had said Thursday that half of the 342 migrants they had picked up were Syrians, sparking concern that the flow of Syrians previously attempting to cross into Europe via Turkey and Greece was shifting to Italian shores. Around 50,000 Syrians arrived in Italy between mid-2013 and early 2014, after which Greece became the route of choice, the IOM said. While only 26 people from the war-torn country have landed in Italy this year, a deal between Turkey and the EU to close down that route and return those attempting to cross has raised fears Syrians would begin once more to set out for Sicily. 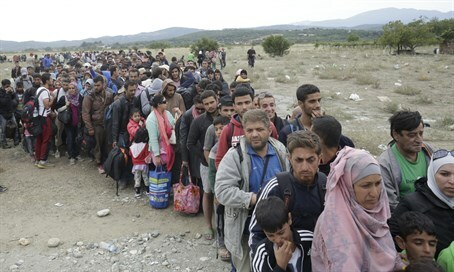 Of the 800 arrivals, only two people were believed to be Syrians. "The information was incorrect," Carlotta Sami, Italy spokeswoman for the UN's Refugee Agency, told AFP after UNHCR humanitarian workers spoke to the newly-arrived migrants on Friday after they were brought to various ports on the Italian island. "There are a lot of different nationalities: Yemenis, Somalis, Eritreans, South Sudanese", she said, while IOM spokesman Flavio di Giacomo said there were also many Egyptians and a high number of unaccompanied minors. The IOM said what was notable was the rise in the number of people setting off from Egypt rather than Libya. The 800 migrants rescued had all departed from Egypt, and there has been a 10-fold increase in the numbers leaving from there in the first four months of the year, compared to the same period in 2015, di Giacomo said. The boats used by Egyptian smugglers are usually in a better condition than those employed by their Libyan counterparts, who rely almost exclusively on poor-quality inflatable dinghies. But the length of the crossing and greater numbers of people packed onto the boats raises the risk of tragedies at sea.